The alternate title for this blog post is: Whose blender is this again? While MIL and FIL enjoyed their vacation, I wanted to make the most of the time I had with their new Vitamix blender. Now that I had sampled turnip soup and hummus, I decided that it would be fun to try making something that required blended fruit. 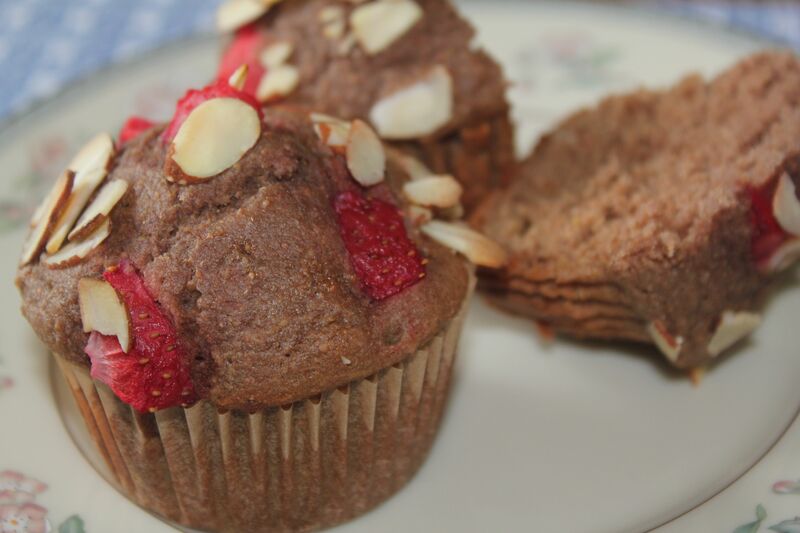 I found a recipe for Strawberry Yogurt Muffins that sounded quite delicious. I made a few changes, altering the flours used and switching the white sugar with maple syrup and the brown sugar with coconut sugar. Canola oil replaced the butter. If you do not want to make a strawberry puree in the blender, just chop up the strawberries very finely. Sometime while I was developing this recipe, a change in my thinking occurred. I mentioned to SensitiveHusband that I would puree the strawberries in “my Vitamix.” Whoops – I actually referred to the Vitamix blender as mine! It’s easy to get attached to such a useful machine. Who would have thought such a thing could happen? In a small bowl combine flours, baking soda and nutmeg. In another bowl, whisk the eggs, maple syrup, yogurt, oil and vanilla. Stir into the dry ingredients just until moistened. Fold in strawberry puree. Fill muffin cups lined with paper liners two-thirds full. Top with coconut sugar, chopped strawberries and almonds. Bake at 375° for 15-18 minutes or until a toothpick inserted near the center comes out clean. Cool for 5 minutes before removing from pan. This entry was posted in Recipes - Breakfast and tagged breakfast, Cane sugar free, Maple syrup, Muffins, vitamix blender, Yeast free. Bookmark the permalink.